For the 10th DIMACS Implementation Challenge, the two related problems of graph partitioning and graph clustering were chosen. 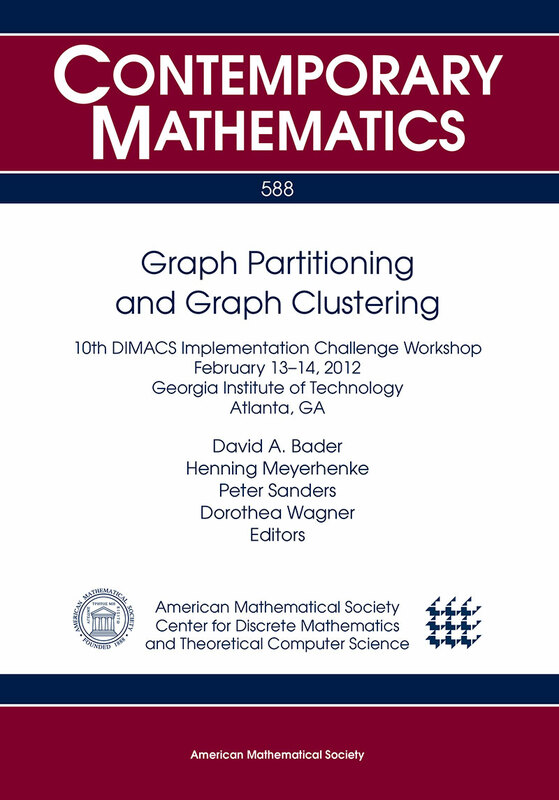 Graph partitioning and graph clustering are among the aforementioned questions or problem areas where theoretical and practical results deviate significantly from each other, so that experimental outcomes are of particular interest. What are the communities within an (online) social network? How do I speed up a numerical simulation by mapping it efficiently onto a parallel computer? How must components be organized on a computer chip such that they can communicate efficiently with each other? What are the segments of a digital image? Which functions are certain genes (most likely) responsible for? One goal of this Challenge is to create a reproducible picture of the state-of-the-art in the area of graph partitioning (GP) and graph clustering (GC) algorithms. To this end we are identifying a standard set of benchmark instances and generators. Moreover, after initiating a discussion with the community, we would like to establish the most appropriate problem formulations and objective functions for a variety of applications. Another goal is to enable current researchers to compare their codes with each other, in hopes of identifying the most effective algorithmic innovations that have been proposed. The final goal is to publish proceedings containing results presented at the Challenge workshop, and a book containing the best of the proceedings papers. The precise problem formulations can be found in the document describing scoring rules and objective functions. The descriptions below served as a starting point for the problem definitions. The most common formulation of the graph partitioning problem for an undirected graph G = (V,E) asks for a division of V into k pairwise disjoint subsets (partitions) such that all partitions are of approximately equal size and the edge-cut, i.e., the total number of edges having their incident nodes in different subdomains, is minimized. The problem is known to be NP-hard. Other important variations of this problem exist. They are often subsumed under the term graph partitioning as well. In the Challenge we consider two objective functions, see the scoring rules and objective functions. Clustering is an important tool for investigating the structural properties of data. Generally speaking, clustering refers to the grouping of objects such that objects in the same cluster are more similar to each other than to objects of different clusters. The similarity measure depends on the underlying application. Clustering graphs usually refers to the identification of vertex subsets (clusters) that have significantly more internal edges (to vertices of the same cluster) than external ones (to vertices of another cluster).